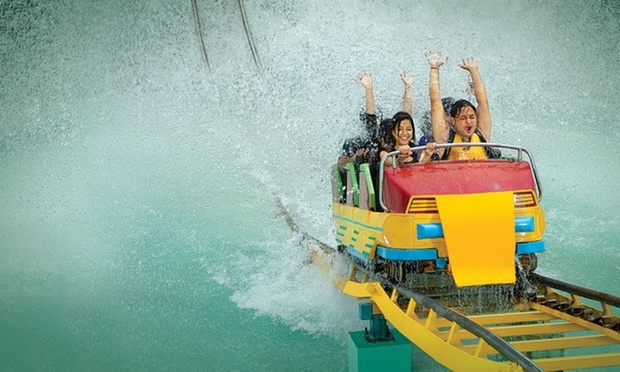 Deal – Get upto 30% discount on entry tickets of Adlabs Imagica, Aquamagica & Snow Park Khopoli Mumbai Pune Expressway March 2019 offers & deals. There are various discount deal like College Student offer deal, Pre booking deal, HappyTuesday, WatAWednesday, GharSeGharTak booking, Bulk ticket booking deal and many more deal. *ThemePark: Lunch, Snacks and Dinner for every guest. *WaterPark: Breakfast, Lunch and Snacks for every guest. *Pickup and drop in a chauffeur-driven A/C car from Mumbai or Pune. Present a valid hall ticket, college ID or school ID. Save big on student tickets, and student ticket & meal combo packages. 1. A valid college ID, school ID, or Hall Ticket is mandatory to avail the discounted pricing for all guests availing the special product. 4. Not valid for special events, and blackout days. 6. NOT applicable on HappyTuesday, WatAWednesday, GharSeGharTak Packages, ByeByeExam, Jr.Child, Passport and ADDONs and BlackOut Days. 7. NO Two Offers can be clubbed. b. Select Date of Visit from Calendar. f. Please apply respective COUPON CODE to avail the exciting discounts. g. After the Payment, you shall receive a TRANSACTION ID via SMS as well as an EMAIL from IMAGICA which you need to carry (no HardCopy required). You need to present the Transaction ID over the counter to collect the tickets. 1. The offer is valid on minimum booking of 5Pax. 2. Valid on Regular and Express tickets to Theme Park and Water Park. 3. NOT Applicable on ADDONs. 4. NOT Applicable on Special/Deal Days like HappyTuesday/WatAWednesday & Packages like GharSeGharTak and preschooler or college student tickets. 2. NOT Applicable on ADDONs (Snowpark 10% discount as applicable). 3. NOT Applicable on Special Days like HappyTuesday/WatAWednesday & Packages like GharSeGharTak. 4. Use Coupon Code – BE15. 5. Valid till 31st March, 2019. 6. NO Two Offers can be clubbed. Student Special! Regular tickets @ Rs. 999 only. Unlimited access to all the rides & attractions at a special price. Show your college ID at the park. Add Rs. 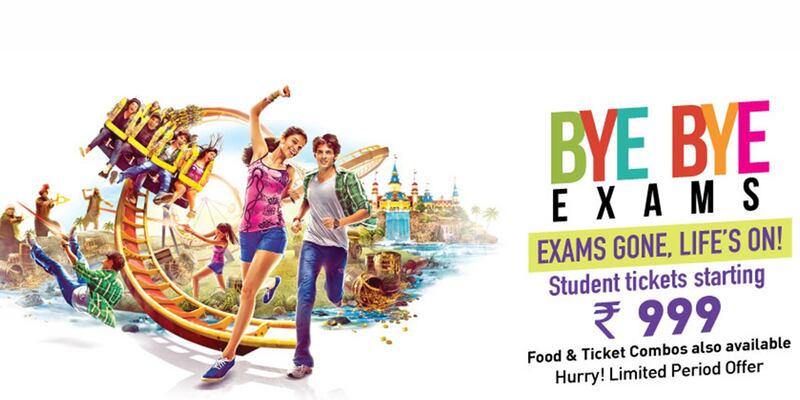 399 to ThemePark Regular Tickets & Get House of Stars,Glowmagica and Eyelusion for FREE. * Food & Merchandise voucher worth Rs. 399. HOW TO REACH AT ADLABS IMAGICA? Choose from the travel options which cater to families and groups of all sizes. Car pickup & drop service is from Mumbai and Pune only. You can either simply add-on a car or choose from super-saver Ghar-Se-Ghar-Tak Package. For return journeys, rickshaws are usually available outside the main entrance. It is connected to Mumbai via direct local trains, and to the rest of the rail network via Karjat station. Select Date of Visit from Calendar. Apply respective COUPON CODE to avail the exciting discounts. Adlabs Imagica is a popular amusement park located at Khopoli. They offer amazing entertaining options for people of all ages. They also offer dining and shopping options. The place is huge with various types of fun rides and the architecture is of international standards. It is a great place where you can spend a memorable time with your friends and family. We updated deal as per Nearbuy website. Currently discount on ticket price available in Aquamagica ticket. But you can get cashback upto 20% in Your Nearbuy account, if you use Nearbuy coupon code mentioned in the post. You can use those cashback to buy other deal on nearbuy. Would like to buy snow world tkts the location is kurla phoenix mill, pl suggest where do I get the discounted coupons. pLz. 1. FUN40 is coupon code of Littleapp, you need to buy deal on littleapp by clicking on littleapp link. cashback generally take 24-36 hour after consumption of the voucher.You can use whole cashback in 1 or more transaction as per your wish. 2. Vouchers are valid till a particular date, Say 1 month or 2 month or 1 year, for complete details you need to contact Customer care of Littleapp or Nearbuy which ever site you want to buy the deal. 3. Mobikwik offer is expire now, it not working. Previously it was working nearbuy website. after consumption of voucher means, say if I made a booking for June 27th, then the cashback would be credited after June 27th? yes, whenever you use that voucher. You not need to buy voucher for a particular date. You have to buy voucher and use any date that voucher. Suppose you buy voucher which applicable only Tuesday, then starting today you can use that voucher on any Tuesday till expiry. I am trying to book tickets voucher on Nearbuy. But nowhere it is showing regarding inclusion of Snow park. Regular price of an adult is Rs. 2185 for date 17-04-2017. Please share the link where snow park ticket is also included or explain me the logic how you are calculating 40% discount on the deal. Please respond urgently as I want to Book the ticket. Hi can I please get a customer care number where you can assist me . I want 2adult tickets for March 6th 2017 for Imagica as well as the snow park. I want your 40% off discount but can’t find it in the app. Please give me a customer care number which can help me guide through please. Eagerly waiting for your response. Free snow park ticket is part of deal. If you buy related deal which offering free Snow Park ticket then you will automatically get snow park ticket & entry. if you use coupon code mentioned in the post, then you can get upto 25% cashback (on purchase of 3 voucher of same deal and apply couponcode – BUY3) on the deal in your nearbuy website account. Looking for a group discount for a group of 35 people on 24th September 2016. please contact me urgently.